Welcome to beautiful Bear Creek Crossing Resort in the Great Smoky Mountains of Tennessee! Inside this gated resort community, you'll find an indoor swimming pool, and outdoor swimming pool, a waterfall area, and a 9-hole putt-putt course! In addition to your cabin's amenities such as hot tubs, game rooms, and pool tables, you'll have plenty of things to enjoy nearby. Better yet, this cabin resort is located only a short drive from exciting attractions in Downtown Pigeon Forge, Dollywood Theme Park, and the Great Smoky Mountains National Park. Best of all, you can reserve a cabin in this resort with indoor and outdoor pool access with Cabins USA Gatlinburg to earn a special discount on your nightly rate! Book online today to save 15% on your cabin vacation in the Smoky Mountains! Check out this amazing cabin with an indoor and outdoor swimming pool from Cabins USA Gatlinburg in the Smoky Mountains of Tennessee! 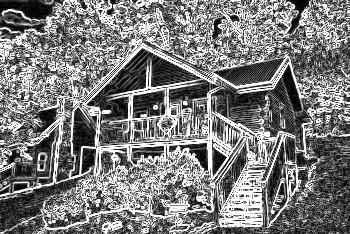 "Dreamland" is a luxury resort cabin in the Bear Creek Crossing Resort Area of the Smoky Mountains with two hot tubs, a resort pool, and a game room.